Join PECAA in the Live Music Capital of the World for the 2019 Annual Meeting! The Annual Meeting is PECAA’s signature event of the year and offers unparalleled business education and resources to strengthen Member practices. PECAA Member doctors and staff are able to attend the event at no registration cost. Plus, this year will feature two new enhanced staff-track courses! We invite you to join your collaborative PECAA community in the live music capital of the world, Austin, TX, as Members work towards growing their practices – together. The 2019 Annual Meeting will be held at the JW Marriott Austin, the largest JW in North America, located just a short walk from Rainey Street and Sixth Street – you won’t be far from the action! Book Your Hotel Room – Space Is Limited So Book Early! PECAA has secured a contracted room block at the JW Marriott Austin in the heart of downtown. Discounted room rates of $265/night are available for all attendees May 13th – 19th only. Rooms are limited so please book your room early! Please book your room online via PECAA’s Room Reservation Page. Member doctors & staff are able to attend the event at no charge! Plus, this year features several round-robin presentations; allowing attendees to customize their own meeting schedules. We’ve also introduced two new enhanced staff-track courses (separate fees are associated with the enhanced courses) for learning & certification. Welcome Party: You won’t want to miss this years’ Welcome Party! You’ll be greeted by the PECAA Team on the JW Marriott Austin rooftop patio between 2:00pm – 6:00pm on Thursday, May 16th where you’ll receive your name tag and goodie bag while enjoying live music near the pool deck! Grab a drink from our variety of happy hour cocktail options and head over to the t-shirt screen printing table for some DIY fun! You may even want to wear your custom-printed t-shirt Friday night at Austin City Limits. Member Appreciation Event: We’ve pulled out all the stops for this incredible Member Appreciation Party! PECAA Members, Vendors and guests will come together to take over two levels of Austin City Limits Live at the Moody Theater from 7:00pm – 10:00pm on Friday, May 17th while enjoying live music! In the heart of downtown Austin, the Live Music Capital of the World, Austin City Limits Live at The Moody Theater is a world-class live music venue and home of the longest-running music program in television history, Austin City Limits. Members will also enjoy world-class Tex-Mex barbecue, a full bar and plenty of fun activities! Stay tuned for our headliner band being announced soon! 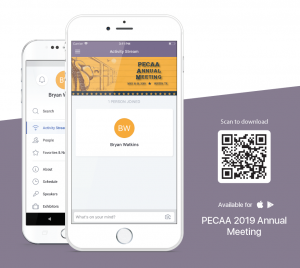 Please make sure to download the PECAA Annual Meeting App for up-to-date meeting information all in one place. Access to this app will only be available for Annual Meeting registrants. The app will be accessible by the unique e-mail address you used to register for the meeting.